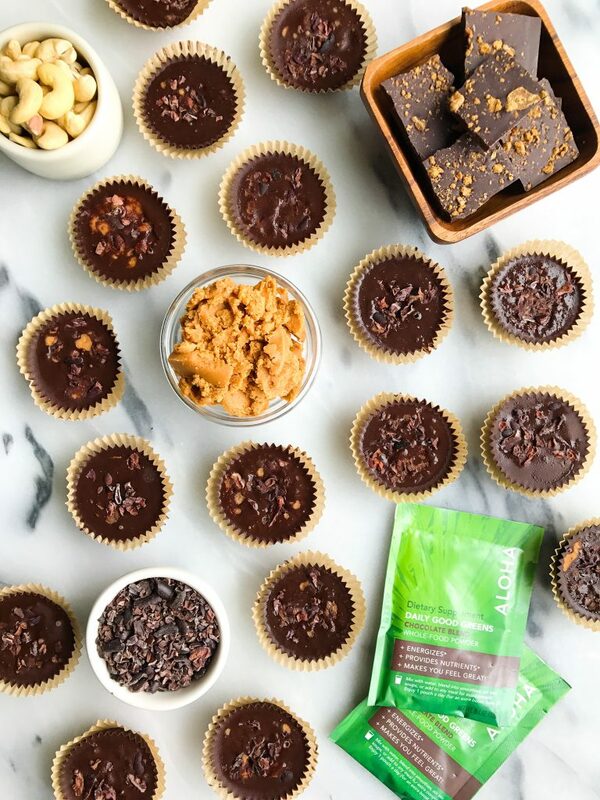 Fatty Dark Chocolate Coconut Butter Cups filled with super greens for an easy low sugar treat! All I need in this life are a few things and dark chocolate is absolutely top 3. Every single day I eat some form of chocolate and I am not ashamed. I crave it. I love it and at this point I am pretty particular about the kind I eat and bake with. I also have started to get pretty crafty when it comes to adding nutrients to all my desserts when I can (Avocado Cookies and Brownies with Greens). When ALOHA sent me their Chocolate Superfood Greens, I was a little hesitant on trying it at first. Chocolate and greens? IN powder form? How would that taste? Well friends, I LOVE it! 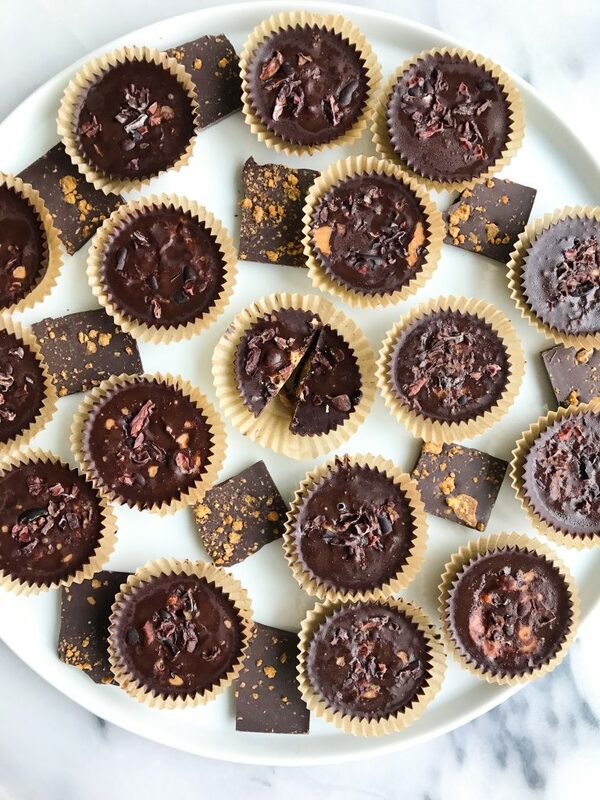 Each serving is filled with fair-trade cacao, peas, wheatgrass juice, spirulina, beet juice, mushrooms and a few other simple ingredients. 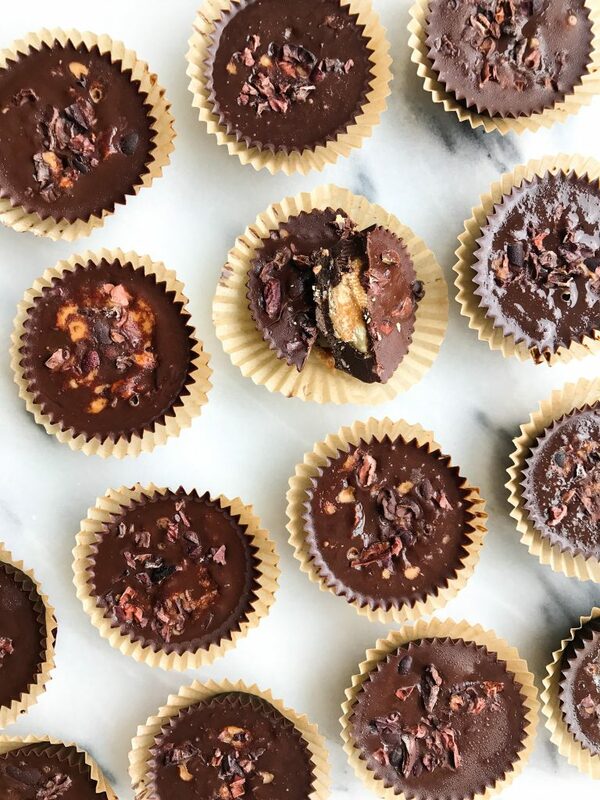 It is organic, non-GMO, vegan, soy-free, gluten-free and you are able to easily add it to desserts, snacks and smoothies to get extra nutrients. You may remember ALOHA from those dreamy Blueberry Chocolate Chip Breakfast Cookies. I am pretty sure the most popular question I get is “what protein do you use?”. ALOHA is a staple protein powder for me. I LOVE the ingredients and how it isn’t too chalky like most protein powders. Between their Superfood Greens and Protein Powder line, they are changing up the way we can sneak both greens and protein into our daily eats. These cups are also filled with fatty coconut butter (my fav), chia seeds and cashews. Such a crunchy and delicious chocolatey treat! Place in freezer for 30 minutes to set and enjoy! Thank you ALOHA for sponsoring this post. It means so much to me to work with brands that I love and who support rachLmansfield!